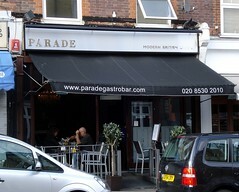 Parade Gastrobar was a bar/restaurant in South Woodford serving modern British food. It has now closed. As of September 2014 the premises are occupied by a restaurant called Purple Thai. Bar/restaurant in South Woodford serving modern British food photo of menu as of July 2009. Inside, the room stretches back alongside the bar/open kitchen which runs along one wall. Seating for about 35-40 people is provided by armless high-backed nearly-black leather chairs set at square tables topped with dark-varnished thick wood planks. The textured matte-black floor is lightened by the light blueish-grey walls. Another area, not quite as nice, seats 14 at the back by the toilets, and there's also a couple of tables outside on a little patio thing raised above the pavement. Kake visited on a Saturday early evening in July 2009. I didn't want a full meal, but they were quite happy for me to just have a starter. I went for the cold pork loin with capers, tuna mayo, chilli, and wild rocket (£7) photo. It was a very generous portion, and the meat was good quality and cooked well, not at all dry. The tuna mayo was oddly inhomogeneous, with some parts much more mayonnaised than others; perhaps two batches had been mixed together? The capers were a good counterpoint to the richness of the rest of the dish. I couldn't taste any chilli, unfortunately. Service was friendly enough, and neither oversolicitous nor inefficient. Tap water arrived promptly, in a tall narrow glass with ice and lemon. A small glass of chenin blanc was £4 and not over-chilled. I'm not sure whether you can come in just for a drink — everyone there during my visit was ordering food. It definitely seems to be a "wait to be seated" kind of place. A commenter (September 2008) known as "Snowtime" tells us that the vegetarian sausages here are some of the best they've ever encountered (as of July 2009, these seem to be provided as a main course with garlic mash and red onion jus for £9.50); also, that there's a small selection of good continental lagers including Budvar and Leffe. Accessibility: A ramp up to get in, with a small ridge/step at the bottom and another at the top. Although they do have a toilet marked as accessible (shared with the gents'), it's up a step (as is the back part of the seating area). The ladies' cubicles are a real squeeze to get into. Last visited by Kake, July 2009. Last edited 2014-09-07 19:32:23 (version 7; diff). List all versions. Page last edited 2014-09-07 19:32:23 (version 7).